The Transport sector (and therefore the outlook for the economy as a whole) didn't have it easy over the past few days. UPS disappointment was enough to break the low volatility slumber markets had enjoyed for the best part of a week. However, the Dow Jones Transportation Average continues to hold firm at its 200-day MA with the 50-day MA on course to trigger a "Golden Cross" - a significant long term bullish signal. How this gets reflected in the Dow is more difficult to predict. 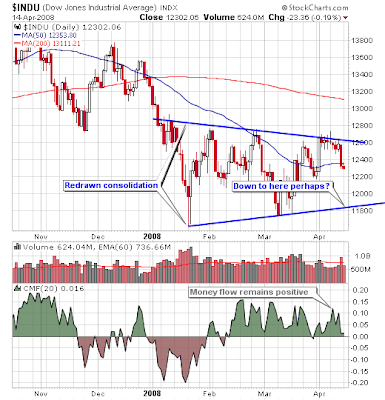 The UPS related sell off brought the index back inside its triangle consolidation. There is still plenty of room for a move back to consolidation support which should be viewed as bullish - no doubt bears will see this as a confirmation of their position, but they will be wrong unless March lows break. 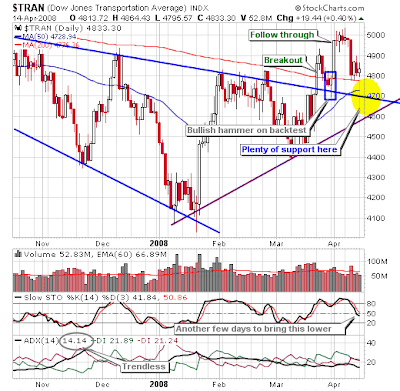 So bulls could endure another 450 point loss in the Dow and still maintain the upper hand, especially if Transports can keep above rising trendline support connecting Jan-March lows (c4600, or 230 points from where the index sits now). For stock buying this means building up positions slowly. Momentum plays are unlikely to get the traction to suceeed so stocks providing value on techni-fundamental levels like P/E and dividend yield are the best bet forward.